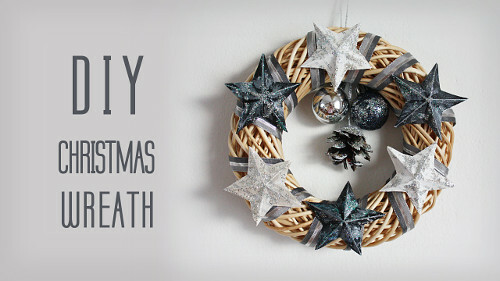 Make an elegant wreath with lots of sparkle and sheen! It's quick and easy and and it creates rustic glam to your home with little effort! - hot glue - or if you want to recycle the wreath in the future, use masking tape like I did! Start with making the stars. Wrap ribbon around the wreath, adhere stars and ornaments, add yarn for hanging and that's it! I used a mixture of white, light blue and silver glitter to achieve the effect I wanted. The combination of colors is timeless and elegant, maybe even a little masculine, you could say. Of course, you could use any color combination you like! You could also make this wreath in larger sizes. This wreath is only 16 cm (about 6 inches) wide and the stars were made of 6 cm (about 2,5 inches) wide paper. Adding glitter is messy as always, but once you get your pretty wreath hanging on the wall or on a door, you won't even remember it any more!